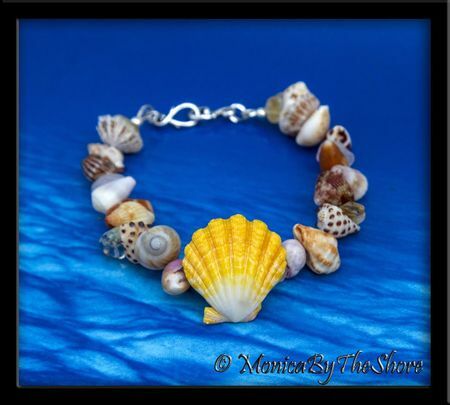 A bright as the Sun Hawaiian Sunrise Shell with washed up North Shore Seashells "Beach Candy" bracelet! Centered around a brightly colored, pristine yellow & white, 1 1/8 inch Hawaiian Sunrise Shell, these surrounding little North Shore seashells that have been washed ashore in the ocean surf are selected for their complimentary colors to make a truly one-of-a-kind piece of Sunrise Shell jewelry. Colorful, bright and full of Aloha, you will love wearing this unique island style bracelet with its variations of colors, textures & patterns. A sprinkling of raw cut Rose Quartz and crystal gold Citrine gem stones give these shells just the right bit of shine! Pure Hawaiian seashell Love and "wearable Aloha"! Bracelet is 7 1/2 inches and is finished with a decorative sterling silver vine hook clasp. 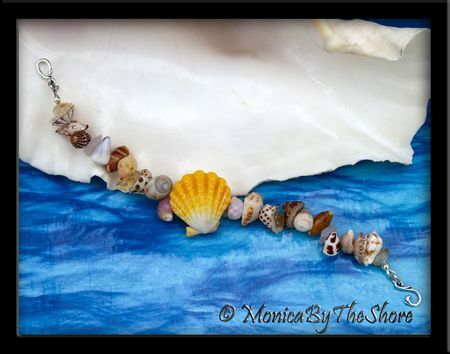 A Hawaiian Seashell collection to wear with aloha and a smile!